Grace Academy currently has 14 students on a trip to the United Kingdom and France. The first 48 hours were spent traipsing around London seeing as much as possible. The plane landed at 11 a.m. on Monday (25 March) at Heathrow and soon after the students boarded an express train into the city. It took three hours to get checked into the hostel, but that left enough time to check out some sites. The first was The National Gallery where they were awed by originals painted by Holbein the Younger, Reubens, Van Gogh, Michelangelo, and many other masters. After this, the students quickly went to the British Library to see an original copy of the Magna Carta, a first edition of the 1611 King James Bible, ancient maps, and much more. 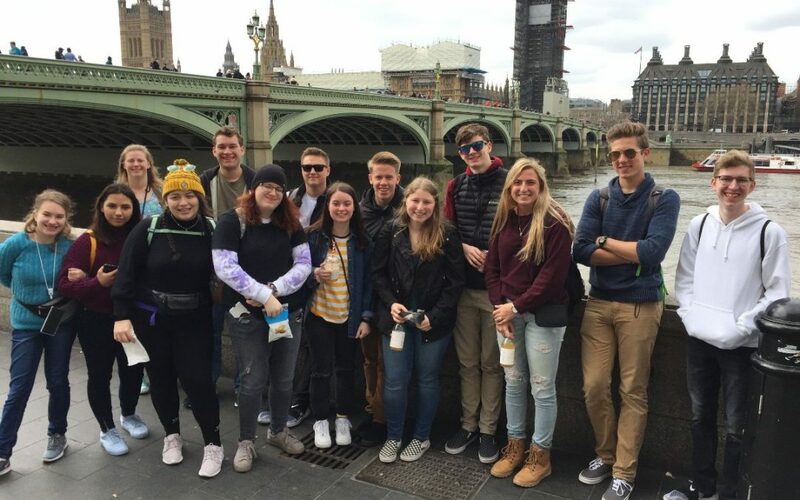 Tuesday the group visited the Tower of London, Westminster Abbey, and the British Museum. After eating at Wagamama, always a student favorite, they went to St. Martin’s Theater to see a performance of Agatha Christie’s The Mousetrap, and arrived back at the hostel at 11 p.m. Before leaving the city on Wednesday for France, they went to St. Paul’s Cathedral, The Churchill War Rooms, and the Imperial War Museum. It has been a whirlwind but everyone is having a great time. The picture above is taken with Big Ben in the background, but it is covered with scaffolding while they repair it. What a fantastic trip, and good weather you’re having! So excited for the students (especially Ash), you and Elizabeth! Praying for you all!